How Do I Pick the Best Breakfast Cereal? Power up for Protein – look for a minimum of 2 grams per serving, preferably 3 or more grams. 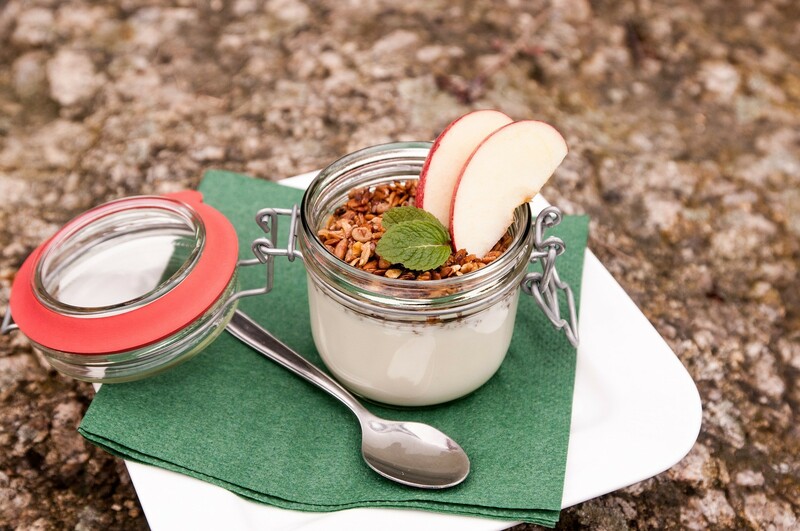 Remember that there are several newer research studies that support a breakfast rich in protein may promote the consumption of less calories over the course of the day and less snacking too. Whole grain is Best – the first ingredient on the label should be “whole ____” not just the grain name like wheat or corn. Oats are an easy breakfast whole grain. The benefit of whole grains is fiber, you want to look for 3 grams of fiber or more per serving to aid digestion and help control cholesterol levels. Remember not to over-do it if you haven’t been eating a high fiber cereal though, you will regret that decision. You may want to start by mixing a high fiber cereal and one lower in fiber. Cut the Fat – your cereal should be low fat, less than 3 grams of fat per serving, with no trans-fat. If you like nuts in your cereal, your fat grams will probably go up, so only have those cereals a couple times a week or eat your nuts as a snack instead of on your cereal. 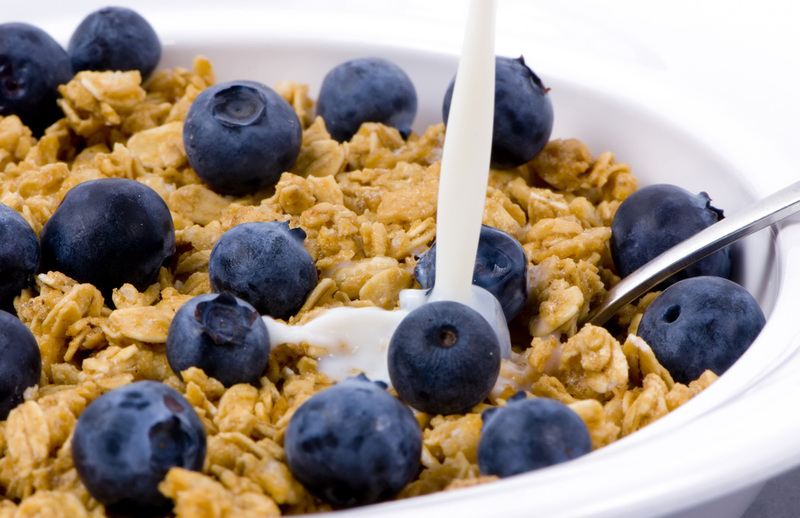 To keep the fat low, use skim or reduced fat milk on top of your cereal. Short Cut the Sugar – added sugar has been a culprit in breakfast cereals for many years. While a number of companies have reduced the added sugar, they may still be higher than recommended. Your goal should be 8 grams or less of sugar per serving, with 5 of less being ideal. Look at the order of the ingredients on the label – do your best to not have sugar be one of the first three ingredients. By keeping your sugar intake lower, you will probably be looking a cereal with 120 – 200 calories per serving. Avoid going over 200 calories with your cereal. Vitamins and Minerals – when you read the Daily Value of vitamins and minerals like iron, zinc, folic acid, or the B vitamins on the package label look for breakfast cereals with 25% or more. Lower the Sodium – the 2010 Dietary Guidelines recommend that for many of us we have no more than 1,500 mg of sodium per day. Look for sodium levels of 150 mg per serving or less per serving of cereal. Remember breakfast really is the most important meal of the day and gives us the fuel to power our morning. There are numerous research studies supporting the importance of breakfast for adults and children. Several keys points in favor of breakfast are: improved concentration, coordination, mood, and performance. Children will get better grades, miss less school, and visit the nurse less often if they eat breakfast. Those who skip breakfast have an increased risk of heart disease, higher blood cholesterols levels, and may have trouble controlling their weight. The best breakfasts should include foods from at least 3 food groups – grain, dairy, fruit, protein, or vegetables. A bowl of cereal with skim milk already gives you 2 of those groups, so adding a piece of fruit or some sliced berries to the top of your cereal is a very way to go. For the morning you are in a hurry, do your dry cereal in a bag or container and throw in dried fruit or bring a bunch of grapes. If you add a glass of milk, a piece of string cheese, or a yogurt — you are own your way to a good day.